61) Then, Lord Krishna got together with the cowherds and ate that food. The Lord of all went to Gokula and enjoyed there. Over here, the brahmins realized that they made a big mistake by violating Lord Krishna’s orders and atoned for it. 62) Lord Krishna noticed that the cowherds were preparing for worshiping Indra and stopped the same. The Lord, the One without any destruction, did so in order to ensure that Indra does not think of HIM as a mere human and also to relieve him of his misconception. 63) The Lord engaged them in HIS own worship by telling them “The worship of the hill is the best dharma for us”; The Lord took a huge form and received their worship which included a variety of food preparations and drink. 64) Indra, having forgotten that Lord Krishna was verily the beholder of the chakra Himself, ordered the clouds to shower huge rains on the cowherds; The clouds, being instructed thus, showered rains that were as big as the trunks of elephants, so as to cause the destruction of Gokula. 65) Noticing that the entire Gokula was suffering a lot because of the rains, Lord Padmanabha lifted that big mountain with only his left hand, which resembled the stem of a lotus plant; All the cowherds entered that mountain along with their cows. 66) Noticing that the entire Gokula was being protected effortlessly by Lord Krishna, even though he rained an enormous amount of water for 7 days, Indra recollected that Lord Krishna was indeed the avatara of the Supreme Lord Hari. He took to the refuge of the lotus-feet of the Lord of Yadus. 67) The thousand eyed Indra, along with the entire group of cow-herds, rushed to Lord Krishna, the One who is the ocean of infinite auspicious attributes, the One who is worshipped by Shiva and who is the Guru of Brahma, the One who is greater than the best and One who has immense radiance, and praised Him with mantras from the Upanishads. 68) O Lord Krishna! the One who has supreme strength! This world has been created by You, the One who has infinite radiance! You are the One who sustains all of this! In the end, You are the One who destroys all! All the bindings and liberation of this world are also due to You! There is none equal to you anywhere! 70) Lord Indra, the lord of the entire group of cows, performed abhisheka to Lord Govinda, the One full of auspicious attributes, and returned. The gopas, whose doubts went away with the episode of Govardhana Uddharana, went to Lord Krishna, the Lord of all words, and prostrated before Him. 71) From then on, the entire group of cowherds realized that Lord Krishna was “Narayana Himself”. They offered even more worship to Him, the One with lotus-like-eyes, after listening from Nanda that Sage Garga had revealed that “Krishna is the same as Narayana”. 72) After having seen that Balarama had killed the demon Pralambasura, the one who could not be killed due to the boon of Skanda, the cowherds were convinced that Balarama too was a special devata. They offered special worship to him as well. 73) Lord Krishna married those gopa-kanyas who had undertaken the katyayini vrata with the sole intention of obtaining HIM as their husband; He also gave joy to those gopa-strees who were wives to others already but had great desire to come to the LORD. 75) Due to the boon given to them (gopa-strees) by HIMSELF earlier, even before Balarama and even before HIS own upanayana, Lord Krishna had great enjoy during the nights; LORD is the chintamani that ensures fructification of all requests and HE is verily without even a trace of inauspiciousness! The 4th chapter of the Srimad Bhagavadgita has been uploaded at the mantras page. It is available in the Kannada, Devanagari and English scripts. In this chapter, Lord Krishna once again explains to the Arjuna the need for renouncing the fruits of action. He also explains Karma, Akarma and Vikarma. He also details the various types of yajnas people perform in the world and the importance and position of knowledge in attaining Him. 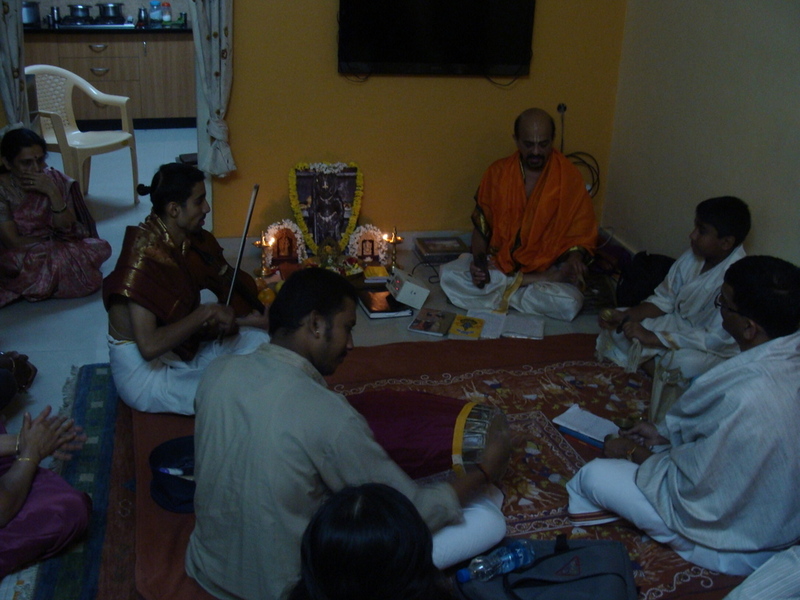 On Tuesday last, Sri Vidyabhushana, the genial singer of dasarapadas, visited our home for a Bhajana program. Once in a while, he visits, along with his team, to houses of interested people and conducts a Bhajana program. We were extremely lucky that he accepted to visit our home this Tuesday. He and his Bhajana group members came at around 6:45PM and performed for nearly 90 minutes. It was a divine experience listening to Sri Vidyabhushana singing some very popular dasara padas. 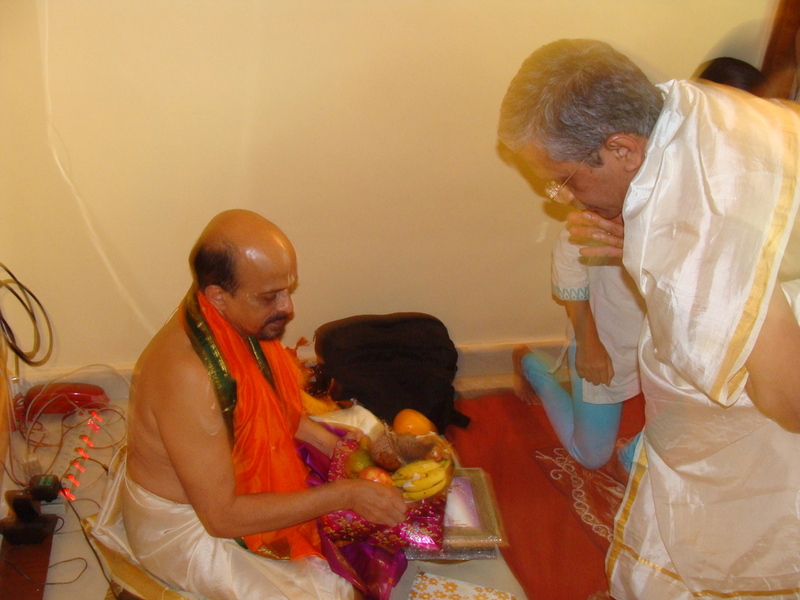 At the end of the journey, he performed a puja. Overall, it was an extraordinary spiritual experience. Recently, I got hold of an excellent book titled “Prana Tantra” written by Sri Sagri Raghavendra Upadhyaya. In that book, I found a stotra on Sri Madhvacharya composed by Sri Trivikrama Panditacharya. I found that stotra extremely powerful. The same can be downloaded in Kannada, Devanagari and English scripts from the mantras page. Wishing everyone a very happy Krishna Jayanti! You can download the Kannada and Devanagari transliteration of the Sri Krishna Stotram from the mantras page. Wish you all a very auspicious Hayagriva Jayanthi! On this occasion, you can download the Kannada and Devanagari transliteration of the Sri Hayagriva Dvadasha Nama Stotra from the mantras page. May Lord Hayagriva bless all and grant ‘true’ knowledge. 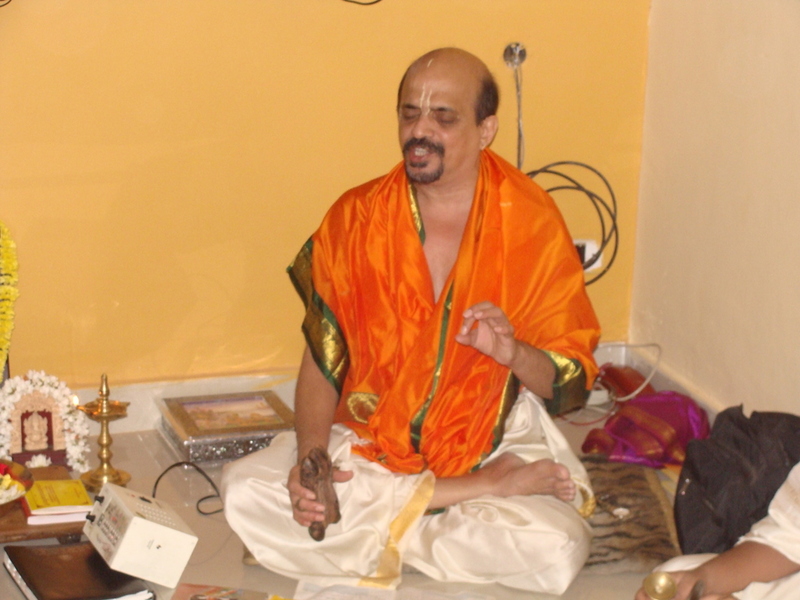 On the occasion of Sri Raghavendra Swamy aradhana, which is coming up on the 14th, 15th and 16th of August 2011, I have uploaded the Kannada and Devanagari transliteration of the Sri Raghavendra Mangalashtaka, which has been composed by his great devotee Sri Appanaacharya. The same can be downloaded from the mantras page. Wishing everyone a sadhana filled aradhana celebration!